On N7, between Brignoles (20 km) and Vidauban (9 km). Located in the heart of the Centre Var, Le Luc is a small town which knows how to mix the charms of it's past with it's modern dynamic local economy. 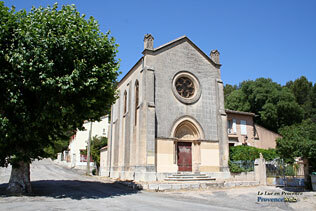 It's location at the crossroads of the main routes in the Var, have helped the development of this agricultural town. The historic town center, with it's narrow streets and little streams, watched over by the 27 meter high Hexagonal tower and the campanile of the Roman clock tower, offers a pleasant environment . 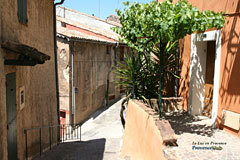 The old town has preserved an array of interlaced streets, partly in shade, partly in the sun, which stretch along the hill side. 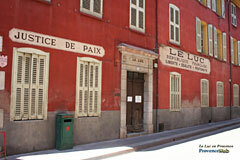 Le Luc is especially interesting for stamp collectors who will find much to interest them at the Regional Stamp Museum. 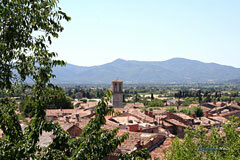 Further afield in the Maures Plaine , the leisure circuit will test the fittest amongst you. The Centre Var History Museum : Located in the Ste Anne chapel which dates back to 1662, this museum presents a trip down the memory lane of the local area. From prehistoric stone implements from the Estérel to the recently closed bauxite mines. Open every afternoon, except Sunday from 1st June to the 15 October. The rest of the year visits by prior arrangement, Tel : 04.94.60.70.20 or 04.94.60.70.12. Free entrance..
Notre Dame de Nazareth church and Clock tower(XIIth), Notre Dame du Mont Carmel church (XIVth) which hosts many beautiful art works (XVIIth century wood, Empire style organs, XVIth century stained glass) and a magnificent XVIIIth century sculptured chair, Hexagonal tower(1517), Centre Var History Museum, Regional Stamp Museum, Horse riding, leisure centre, karting, swimming pool, golf course.